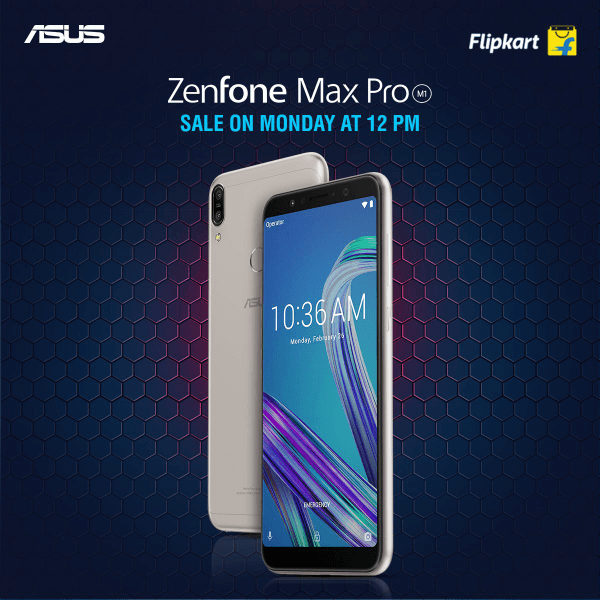 Asus Zenfone Max Pro M1 will be available for purchase at 12 PM today on Flipkart. Asus has announced this news on Flipkart saying that it’s Surprise Sale because of the popular demand from for the handset. Usually, Asus holds a flash sale of the smartphone every week on Thursday, but this week, it seems like the phone will be available for grabs in two flash sales. All the three variants of the smartphone in Black and Grey colours can be picked up during today’s sale. For the unaware, the Asus Zenfone Max Pro M1 is exclusive to Flipkart in India and it boasts excellent hardware for the asking price. The phone has an 18:9 display, dual rear cameras, Snapdragon 636 SoC and more. Pricing of the device starts at Rs 10,999. The Zenfone Max Pro M1 sports a 5.99-inch Full HD+ display with 18:9 aspect ratio on the front. It’s powered by the Qualcomm Snapdragon 636 chipset, mated with 3GB/4GB/6GB of RAM and 32GB/64GB of internal storage. There’s a microSD card slot as well for storage expansion up to 2TB. The handset features a 5-magnet speaker, and it delivers excellent sound through the loudspeaker. There are two cameras on the rear side. The base variants (3GB+32GB & 4GB+64GB) has a primary 13MP primary sensor which is paired with a 5MP depth sensor. On the front side, these variants have an 8MP selfie shooter. The premium variant with 6GB RAM and 64GB storage comes with a 16MP+5MP rear cameras and a 16MP sensor on the front too. The camera app offers various modes such as HDR, landscape, sports, flowers, backlight, candlelight, sunset, night, beach and snow. Both the front and rear cameras offer Portrait mode. The phone is powered by a 5000mAh battery out of the box and runs on Android 8.1 Oreo. Connectivity options in the handset include Dual 4G, VoLTE, Wi-Fi 802.11 b/g/n, Bluetooth, GPS and a Micro USB port resides on the bottom. Asus has launched the device aggressively at Rs 10,999 for the base variant with 3GB of RAM and 32GB of internal storage. As for the 4GB RAM and 64GB storage variant, the price is set as Rs 12,999. The premium 6GB RAM option with 64GB of internal storage and upgraded front, rear cameras will be available for Rs 14,999. Flipkart is also offering its Complete Mobile Protection Plan at Rs 299 only. Slow motion is missing from the camera. The camera is very basic. Need more enhancements on it. And some bugs in the UI. Other than that the phone is fast and responsive.